I’m losing a day in the air, so I thought this could hold you over. 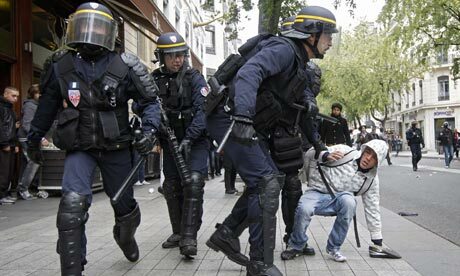 Earlier this week, The LA Times reported that French riot police were protesting a ban on drinking on the job. French riot police. AP photo by Laurent Cipriani. Appeared in The Guardian. Their dark blue armored uniform has led to the nickname RoboCops. *The Interior Ministry ordered the crackdown last week after several officers with the CRS, whose motto is “Serve,” were pictured swigging from beer bottles while deployed last fall at a student demonstration. *Article R4228-20 of the French Labor Code, which bars the consumption of hard alcohol in the workplace, does allow public and private employees to enjoy about an 8-ounce glass of wine, a small beer or a glass of apple or pear cider while on duty. The rule was reiterated in an official directive to public workers in 1989. *Even packed lunches issued to CRS officers deployed in their trademark navy blue vans and buses come with a small bottle of beer or wine.